Newest Explorer edition is introduced for the 2013 model year. Ford’s Explorer has been a popular model for the Ford Motor Company, reaching peak sales above 400,000 units annually in the 1990s as the sport utility vehicle craze took hold. Sales eventually dropped as consumers switched to more fuel efficient models, but the Ford Explorer has always been a good seller for this manufacturer. In 2011, Ford updated its popular SUV, switching from a body on frame design to a unibody construction, a move that improved agility and gas mileage, but at the expense of off-road utility. For 2013, Ford resolves the off-road limitations of this model by introducing the Explorer Sport, a model equipped with full-time four-wheel-drive and a more powerful engine. A 3.5-liter EcoBoost V-6 engine powers the 2013 Ford Explorer Sport, a top of the line model that goes on sale later this year. This engine employs twin turbocharger technology and brings in direct fuel injection to deliver more power in a smaller footprint. Ford estimates that this model will make at least 350 horsepower and deliver a near equivalent foot-pounds of torque. A six-speed shiftable automatic transmission is standard, with steering wheel mounted paddle shifters enabling Explorer fans to enjoy a more engaged drive as they head down the highway. Ford estimates that the Explorer Sport will achieve 16 mpg city and 22 mpg highway, numbers that are better than the competing Dodge Durango R/T, the Jeep Grand Cherokee and Land Rover’s Range Rover Sport. The Ford Explorer Sport seats up to seven adults and sits on a 112.6-inch wheelbase. This model is 197.1 inches long, 90.2 inches wide and is 71.0 inches tall. The Explorer Sport offers 151.7 cubic feet of passenger volume and can tow up to 5,000 pounds when properly equipped. Besides the EcoBoost engine offered in the Explorer Sport, a standard 3.5-liter V-6 is found elsewhere and a smaller 2.0-liter EcoBoost four is available with some models. Among the significant differences found in the Explorer Sport are its chassis as it has been specially reinforced, making this model stiffer and improving its handling. Also, a solid-mounted electric power-assisted steering rack is included, providing an improved feel and more responsiveness to drivers both around town and off-road. Larger brakes ensure that this vehicle comes to a certain stop and a new terrain management system helps drivers work their way through snow, mud, sand and up hills. On the outside, the changes most notable with the Explorer Sport can be seen in its black grille. What isn’t as readily noticeable, but is still quite functional, is the opening in the lower fascia designed to allow for additional cooling. This model is equipped with unique, painted 20-inch wheels and offers blacked-out treatments to roof rails, side mirrors and light housings. Inside, the cabin features a black charcoal theme as evidence across the seating surfaces with cloth or leather materials offered. Unique steering wheel stitching, special door appliques and Explorer Sport badging can also be found. Notably, the changes inside also bring in the highest level of amenities found across the Explorer line. These include a dual zone climate control system, a 10-way power driver’s seat with power recline and lumbar, 6-way power front passenger seat with recline and lumbar, heated front row seats, a rear view camera, SYNC with MyFord Touch driver connectivity and a 12-speaker Sony audio system with HD radio. Available options for this model include active park assist, a blind spot information system, unique inflatable rear seat belts, power folding side mirrors, a 110-volt outlet, remote access with push button start, adjustable driver pedals with memory settings, a dual-panel moonroof, a power liftgate and a trailer towing package. Ford has not announced pricing yet for this model built at its Chicago assembly plant. That information will be released shortly before the model arrives in Ford showrooms this year. Given that the Ford Explorer Limited retails from $37,855, a $40,000 price tag for the Explorer Sport seems likely. Matt Keegan writes for FordHood.com, a Ford enthusiast website. 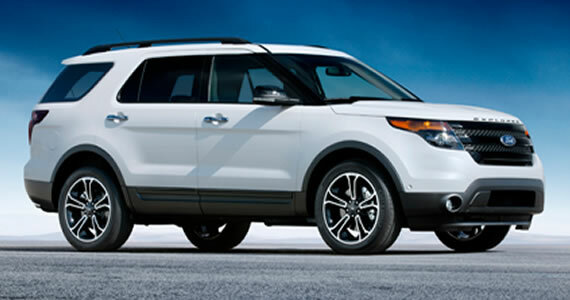 FordHood offers the latest product information including the Ford Explorer Sport and other upcoming models. Photo: Courtesy of the Ford Motor Company.